The current colony outdoors is facing the toughest part of winter right now. Here, inside, we are safe and warm. The cold and snows we’ve had recently require regular pilgrimage to the feeding stations – depending on which way the wind blows, adjustments need to be engineered to keep the food from getting buried, to keep the walkways under the decks where they hide, clear, to make it as easy as possible for them to get to the food source. 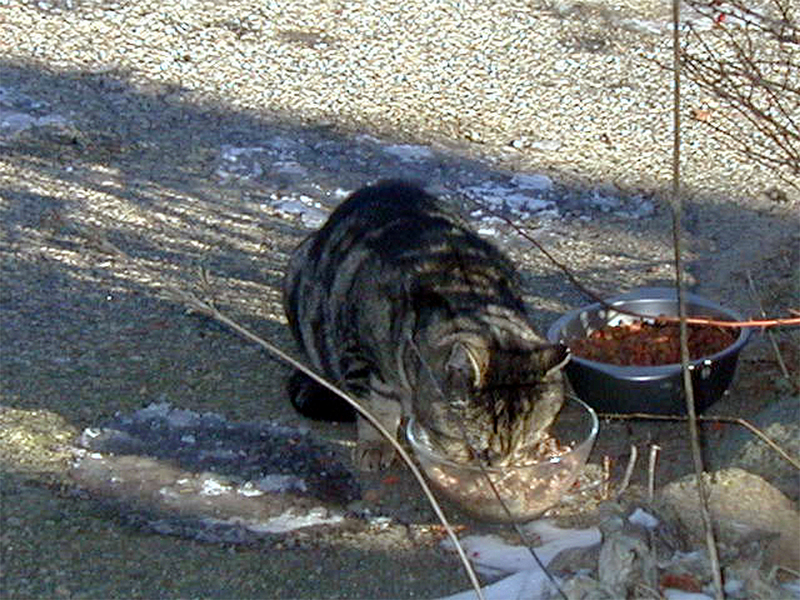 Dry food, in large heavy plastic, or metal bowls, will not freeze into bricks, but even if laced with frost will remain bite-size. Wet food provisions need to be timed with sightings, otherwise it just freezes before they get to it. Wherever possible remove snow from their “rights-of-way” and do not use chemical salts and snow-melts on trailed land.